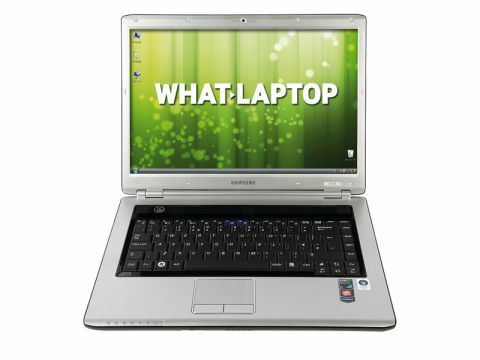 Samsung's entry-level laptops regularly impress us and the R505 (£427 inc. VAT) is no exception. As well as being one of the most affordable choices for the specification, its great usability, design and screen make it ideal for first-time buyers. Weighing 2.7kg, its chassis matches the lighter laptops in this price range. Build quality is excellent and only the glossy lid slightly lets it down. Although it adds a stylish look, it is easily scratched and smudged, so requires adequate protection. Average mobility is provided by the 155-minute battery life. This still falls below the three-hour minimum that we expect from a modern laptop. It suffices for basic daily use, however. Where this laptop excels is its fantastic usability, as the keyboard is one of the best you can find at this price. All the keys are responsive and move silently. They are also firmly fixed, so there is no flex when typing. The touchpad and mouse buttons are equally impressive and respond well. Image quality from the 15.4-inch screen is excellent. It's not quite as bright as the Acer Aspire 5536, but colours and contrast are strong and images are sharp and well defined. The only flaw is that the Super-TFT panel has one of the more reflective coatings that we've seen. At this price, many laptop manufacturers use entry-level Intel chipsets, but in this case Samsung has instead used an AMD processor. While the dual-core abilities make it well suited to basic multi-tasking, we found its Intel-powered rivals to be faster and far more responsive. Graphics performance is more pleasing. The use of a high-definition (HD) compatible ATI graphics card means there's enough power for basic gaming, and smoothly running HD video, and you can also edit digital photos and movies. Storage options are strong and match the more expensive MSI VR705. The 250GB hard drive is ample for most home use, and the dual-layer DVD rewriter lets you create your own music CDs and movie DVDs. Basic compatibility for flash card formats is also provided by the 3-in-1 card reader. Wireless connectivity is less impressive. While rivals most feature cutting-edge 802.11n Wi-Fi, the R505 offers basic 802.11g compatibility. While this is an older and slower connection, it's more than capable for accessing wireless hotspots at adequate speeds. Despite its minor shortcomings, the R505 is a fantastic entry-level laptop. With usability to shame more expensive systems and its capable, if unremarkable, performance, this is a great laptop at an equally pleasing price.